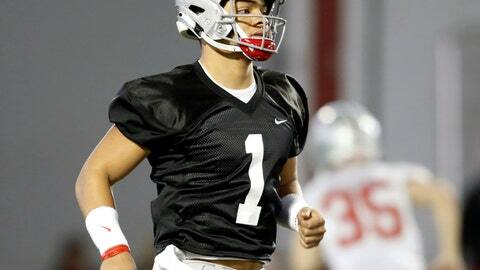 Ohio State is ready to unveil new quarterback Justin Fields at the Buckeyes’ spring game. On the latest AP Top 25 College Football Podcast, Bill Bender of the Sporting News joins AP’s Ralph Russo to chat about the new-look Buckeyes. What will Ryan Day’s influence on the team be as he takes over for Urban Meyer. Plus, how Jim Harbaugh and Michigan are trying to finally catch up with Ohio State. Bender and Russo discuss last three of last season’s surprise teams — Washington State, Syracuse and Missouri — and try to figure out which one is best positioned to sustain its success. Also, Nick Saban went on rant that wasn’t all that ranty about players leaving early for the NFL. What triggered the Alabama coach?